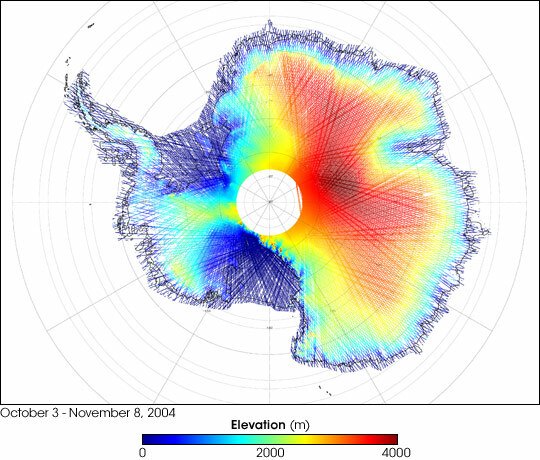 Launched January 12, 2003, NASA’s Ice, Cloud, and land Elevation Satellite, or ICESat, is designed to measure the mass balance of Earth’s ice sheets (balance between processes that add ice to the ice sheets versus processes that remove ice), the height of clouds and aerosols, and the topography of the land. 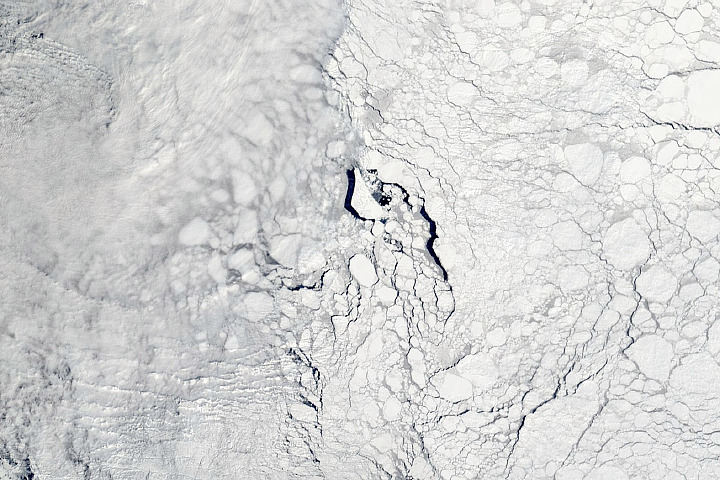 A primary goal of the mission is to help scientists determine whether the ice sheets of Earth’s poles are growing or shrinking, and to better understand how changes in the atmosphere and climate affect the polar ice caps and global sea level. 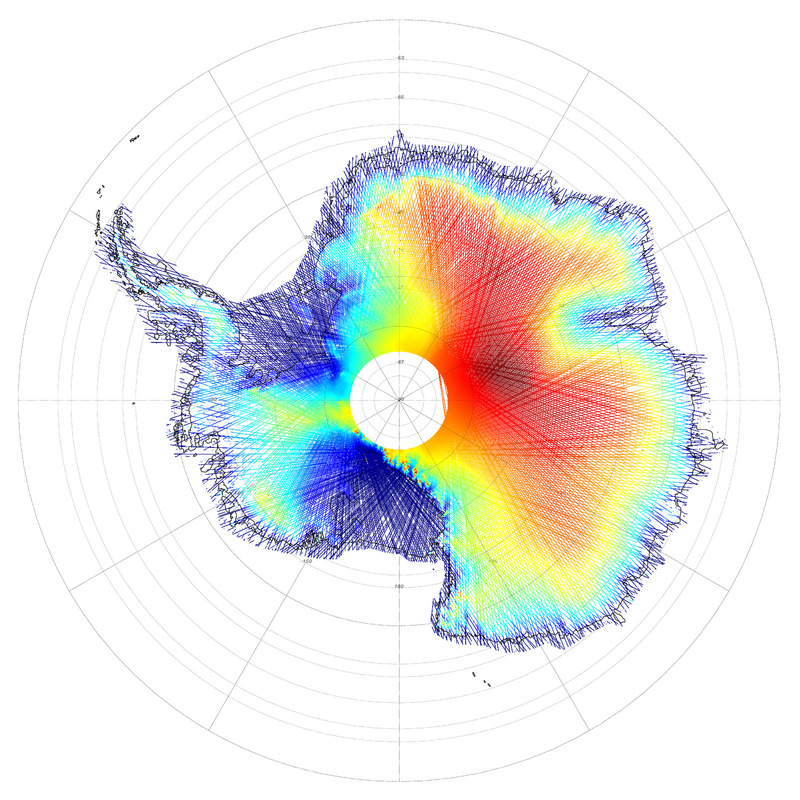 The colors on the map above represent ICESat’s measurements of Antarctica’s topography, using data collected from October 3 through November 8, 2004. Red shows the highest elevations (up to 4,000 meters above sea level). Yellow, green, and turquoise show progressively lower elevations (green is 2,000 meters above sea level). Dark blue shows sea level. 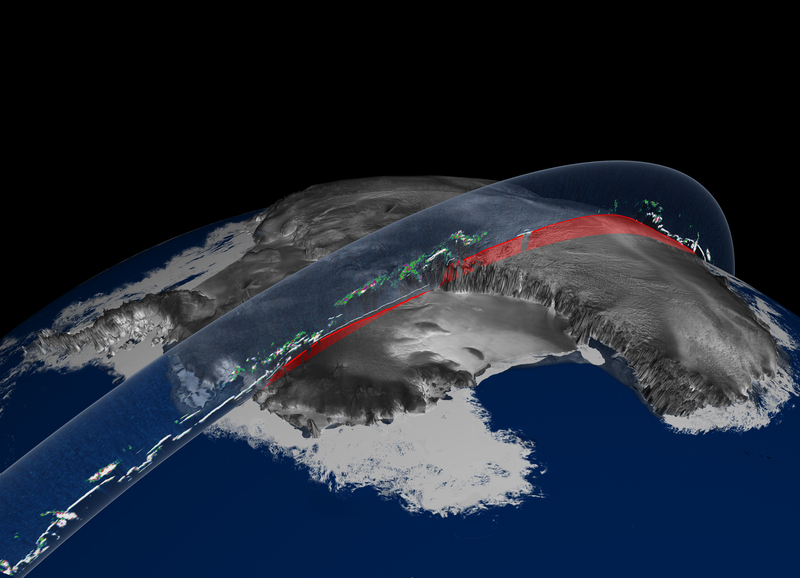 The artist’s rendering above represents a swath of data collected by the Geoscience Laser Altimeter System (GLAS) aboard ICESat. Forty times per second, the GLAS instrument fires infrared and green laser pulses at the Earth at 1,064- and 532-nanometer wavelengths, respectively. (These laser pulses are not dangerous to humans or animals.) By measuring how long it takes for the laser to travel to Earth, bounce off an object on the surface or in the atmosphere and travel back to the satellite, scientists can determine how far away that object is. In this way, scientists can accurately measure the elevation of the land as well as the heights of clouds and aerosols, as shown in the “slice” of GLAS data. The red band closest to the surface represent the elevation. Notice how the elevation is higher on the eastern side of the continent and drops off toward the west, where the peaks of the Trans-Antarctic Mountains descend to the Ross Ice Shelf. To learn more about the ICESat mission, please read the ICESat Mission Fact Sheet, and visit the ICESat Home Page. 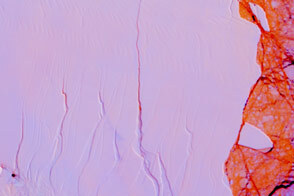 NASA image (top) courtesy Christopher Shuman, ICESat Deputy Project Scientist, Goddard Space Flight Center. Artists’ rendering (below) courtesy Greg Shirah and Alex Kekesi, Scientific Visualizations Studio, Goddard Space Flight Center.